Happy belated Easter friends! Coming back to reality after spring break has been super difficult, but luckily there is lots of leftover Easter candy which tastes great with my coffee and Allergy medicine! We started our Easter fun early on Maundy Thursday by visiting Green Meadows Petting Farm in Kissimmee with my parents. Jacob had fun seeing all the animals and even held a baby chick! He also got to participate in their egg hunt. But first, all egg hunters got to compete in the hula hoop contest. Jacob mostly just lifted the hula hoop up and down, so we don't be winning any hula hoop prizes anytime soon! He did enjoy watching everyone else hula hoop. Then finally, it was time to egg hunt! 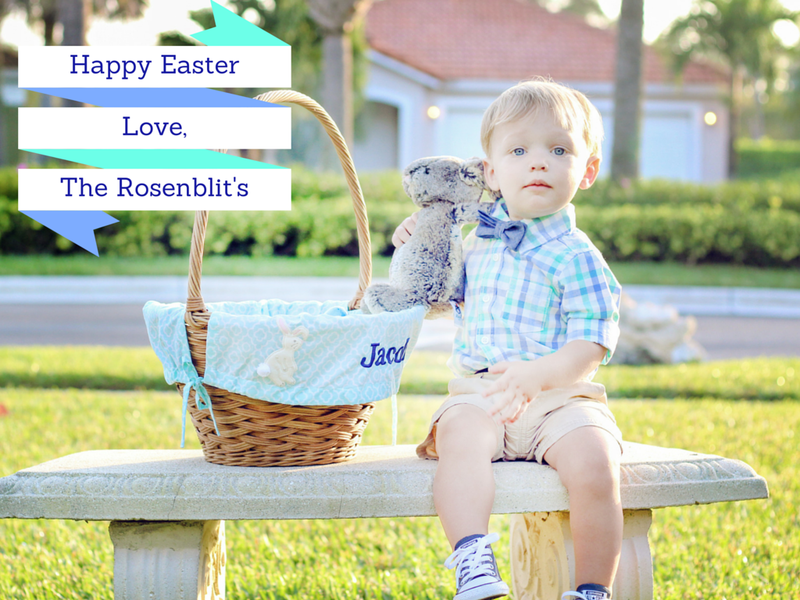 This was Jacob's first egg hunt and while he didn't understand that there should be a sense of urgency to egg hunting, he did manage to get quite a few into his basket! Before we left he got to visit with the Easter bunny, which was not his favorite. He didn't cry, but he seemed unimpressed with the whole thing. Can't say we blame him... He was one tired boy by the time we left! On Saturday after we returned home from Spring Break Jacob got to egg hunt again at our city's local Easter parade. This time he knew just what to do and grabbed as many eggs as he could into his basket. Once the hunt was over we got some fresh apple cider donuts (our favorite!) and then headed home before the day got too hot. Later that afternoon after nap we decorated some bunny cookies for Easter dinner and dyed some Easter eggs using cool whip and food coloring - which ended up way messier than I thought! A bath was in order after that and I spent quite a bit of time scrubbing dye out of our skin and clothes! Finally Easter Sunday rolled around! We woke up early (as usual) thanks to Jacob's internal clock. We had our traditional cinnamon rolls which I tried to shape into bunnies, but didn't make the ears long enough. Jacob didn't care that they looked more like bears, he went right for those ears! and then it was time to open his basket! We filled his Pottery Barn basket with all of his favorites - Mickey, books, trains, and more! Daddy even got him a chocolate bunny lollipop which he quickly devoured! For lunch we had bunny tail pancakes, and then later that evening we went to Jacob's Mimi and Pop Pop's for Easter Dinner. I hope you had a wonderful, blessed Easter with your families!